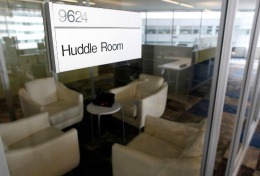 There was an interesting article in the Boston Globe recently about my client, Biogen Idec’s, new space. It doesn’t have offices or cubes (finally, the death of the cube). It has open adaptive space, workstations connected to treadmills and huddle rooms for impromptu meetings. The hope for this radically different design is to drive innovation, speed and allow for more informal, unplanned communication. Many, many companies are talking about how to drive innovation in the workplace. The design of physical space definitely plays a part. But, it only helps if people can free up mental space and time to take advantage of the space. There doesn’t seem to be enough of either in the world of work. In many of my client’s work environments; there is no time for informal, unplanned communication because people are scheduled into back to back meetings day after day after day. They have so many things on their ‘to do’ list and little time to prioritize so the focus is on getting them done but not on what if we did this instead? Or how can it be done better? Colleagues are unavailable because they are on the road or in other meetings. If innovation is part of your company’s mantra these days, look at how you spend your days. • Is there enough time for informal conversations that are spurred by an idea or new issue? • Are there scheduled meetings that can be combined or don’t need to happen at all? • How easy is it for me to get in touch with colleagues either in person or through technology? • Have interactions become so formalized that there’s no time for what’s not on the agenda? You may also want to think about bringing down a few cubicle walls. How Effective Is Your Leadership Team? Love vs. Fear, Making It Great and a Sense of Purpose Announcing the launch of our new website!